The free Health Insurance Plans for Indiana through Maine are a simple set of templates designed to do one thing, help you find the perfect healthcare plan for you based on income and every other factor imaginable. You might be baffled by the sheer amount of plans that the major insurance providers offer and finding the one that matches you best can become quite the challenge. Our templates have all the information and using a filter, you can choose options like price, premiums, coverage, and more. Getting started is simple too. All you need to do is follow the directions given to you below and you’re you’ll be done! These templates cover plans for Indiana, Kansas, Kentucky, Louisiana, and Maine. Download the free template is simple. Just scroll to the bottom of this page and click the link next to your state. When you have the document, open the file to get started. 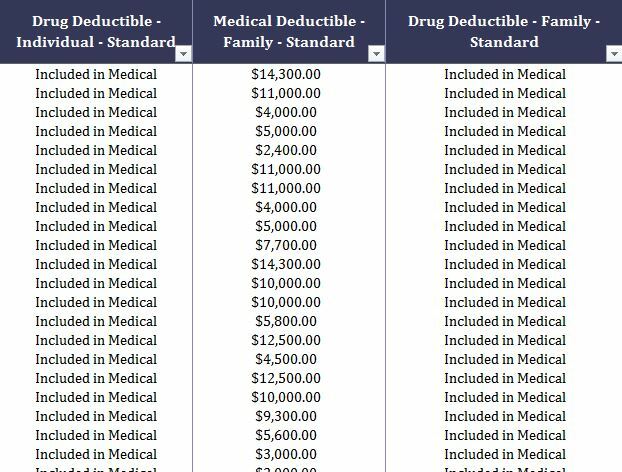 In the first row, you will notice there are drop-down menus available for you to pick and choose the items you like in a healthcare plan and those that you don’t need. Start by choosing your state, county, and the provider that interests you for your state and then move on to the next set of directions. You will then go through the entire top-row and select the items you want from each category column. This may take some time but the filters will help you find the perfect plan by the end of your journey. Give this template a try by downloading one of the links below.